Kitchen island seating is probably the last detail of your kitchen you'll consider, but it should never be an afterthought. A kitchen island unit without seating is nothing short of a missed opportunity, and a kitchen island without good-looking seating is missing the point: the seating shouldn't just be practical, but should add to the kitchen's overall feel. Happily, there are many ways to add a comfortable and handsome spot to rest your derriere. A little advanced planning will ensure the best solution for your needs. Don't miss our kitchen island design ideas to ensure your seating works with this important element. Start by deciding what you need seating for: how many do you need to accommodate and for how long? If your island will provide the only eating area in the room, dedicate as much dining space as you can spare. And be sure to source bar stools that are designed for easy access and comfort – high backs are best. Next, think about the area around your island, which will help determine where the seating should go. Stools that tuck underneath a breakfast bar, out of the way, can be helpful in maximising space in small kitchens but try to imagine them in use too. Will your guests be sitting in the way of a main entrance or access to the fridge? One final tip; locate your seating well away from your island’s hob, if applicable, and prep spaces to keep little fingers safely away from hot pans and sharp knives. Clever design details can elevate inexpensive cabinetry to designer status. Here, barely-there chrome legs create the illusion of a contemporary cantilevered dining space – without the costly structural engineering of the real deal. Caple’s Darga kitchen in white, costs from £6,200. Banquette seating offers the cosy intimacy of your favourite diner, at home. It’s also a great space-saving solution on a kitchen island unit, as fitted seating requires less floor space than freestanding. This elegant bespoke banquette (also seen top), upholstered in luxurious leather, is by Humphrey Munson. 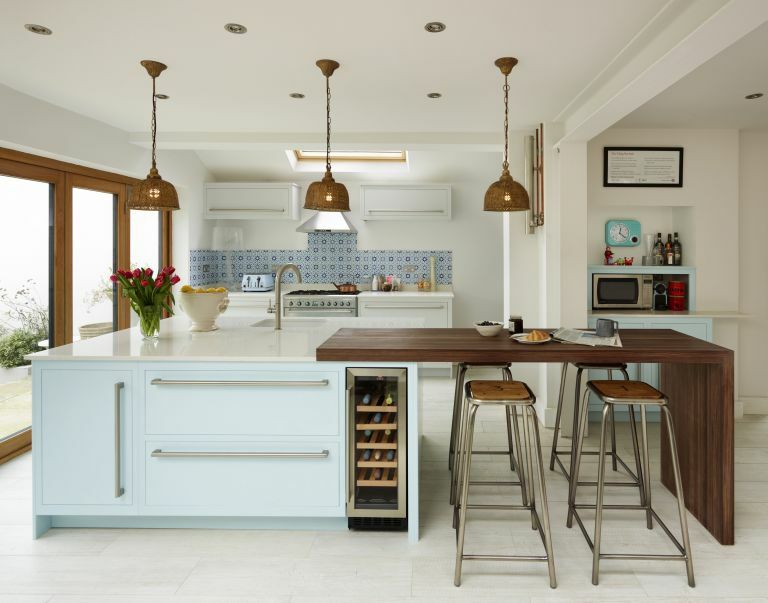 Brightly coloured bar stools can play a vital role when colour co-ordinating your kitchen. We love how the zesty lemon hues of these Ernest bar stools work with that stunning mural and the statement light shade. If you love this kitchen, head over to our colourful kitchen design ideas. Squeezed for space in a small or narrow? All you need is a small overhang and a couple of simple wooden stools to create the perfect resting point for your morning coffee. If you are after more inspiration on how to make the most of a small kitchen, check out these beautiful small kitchen design ideas. Cover all the bases with an island that boasts bar style seating at one end, and a lower dining level at the other. This dynamic island from Davonport’s Soho range features a stunning mix of materials including sandblasted ash, industrial concrete and hand-stitched fabric panels. Designer bar stools can instantly take a classic kitchen in a fresh modern direction. Here, the unexpected combo of manmade polycarbonate and natural timber is seriously covetable. It could work the other way round too, say industrial style, rustic bar stools in a contemporary kitchen. A raised breakfast bar will elevate your kitchen island design, literally, and provide a separate surface for serving drinks, away from the clutter of cooking and prepping. This is the Calatrava Island from Wren Kitchens. For more ways to make the most of a small kitchen, make sure you check out our dedicated feature. Legroom can be an issue with traditional breakfast bars, not least when small children kick and scuff the rear panel as they clamber onto a stool. This generous kitchen island with seating for four solves the problem nicely and provides a spacious elevated dining area for all the family. While a bar stool is the perfect pit stop for a quick lunch or glass of vino, there’s no denying a dining chair is more comfortable for languishing over dinner. If your kitchen is your only dining option, consider a drop-down kitchen island like this sleek design by Kitchen Architecture. We are so in love with this kitchen island seating idea. The breakfast bar on this bespoke island unit is shaped like the end of an elegant table, complete with beautiful hand-turned legs. The results are undeniably striking and provide plenty of kitchen island seating space too. If this kitchen is a bit of you, head over to our white kitchen gallery for loads more ideas and inspiration. Lewis Alderson’s bespoke hardwood kitchen, painted in Little Greene’s Mortar 239 and True Taupe 240, Beetle stools are from The Conran Shop. Easiest way to transform your kitchen into a chic kitchen diner? Add kitchen island seating straight from the Jazz Age. This New Deco kitchen by Martin Moore features velvet-upholstered kitchen island seating, which completes the Jazz-era-inspired design scheme (and takes comfort to the next level). Want to create a laid back look? Pinch this kitchen island seating idea and mix and match classic metal chairs with a wooden kitchen island – or breakfast bar in a small kitchen – and pile the worktop with house plants to complete the relaxed look. Make like the Shakers and keep things simple and pratical. The pared back design of these stools from Plain English fit perfectly in this no-fuss (but also totally gorgeous) kitchen. To recreate this look, pick island seating in neutral colours that are a near match to your kitchen cabinets to keep the look cohesive and classic. If you love the look, find more Shaker-style kitchen design ideas, over in our gallery.